Back in January, I was thinking about the blog and realizing that I've been blogging for nearly three years, we've made a lot of dishes in our kitchen, and consequently, we have a rotation of favorites, and when you are a food blogger with a rotation of favorite dishes, it doesn't make for very exciting blog posts! There are far fewer new cooking experiences to write about. On the dining out front, we only eat out once a week, we have our go-to places, and sometimes, in really busy months, we don't make an effort to try anywhere new. That means less restaurant food to write about. We live west of the city in 'the land of chains' so when we're not feeling like driving into the city or we are too busy to take the time to drive into the city, we choose to eat at Bocktown. We really enjoy Bocktown but there's only so many posts about Bocktown I can write! So back in January, I started thinking I should have a blog 'resolution' of sorts. But I knew that a goal of making every recipe in one cookbook or trying a bunch of recipes for one dish in a quest to find the 'perfect' version of that dish would annoy me. I also know that at times, life just gets too crazy to try one new recipe a week. Not to mention that in the summer, we grill. A lot. I get bored writing about grilling the same in season veggies every week, and I am sure readers roll their eyes when they see grilled zucchini. Again. Anyway - my resolution, which I failed to blog about, or even to mention to SP until recently, is to try 12 new restaurants and to return to 12 restaurants we really enjoyed in 2012. An average of one new-to-us restaurant a month, and one 'we really liked this place why haven't we gone back in the past year' restaurant a month. So far we're doing a good job of trying new places (Pino's, Spoon, Cure) and getting back to places (Burgatory, Il Pizzaiolo, Silk Elephant). This past Saturday we added another 'new to us' place to our 12 new places in 2012 list: The Porch At Schenley. 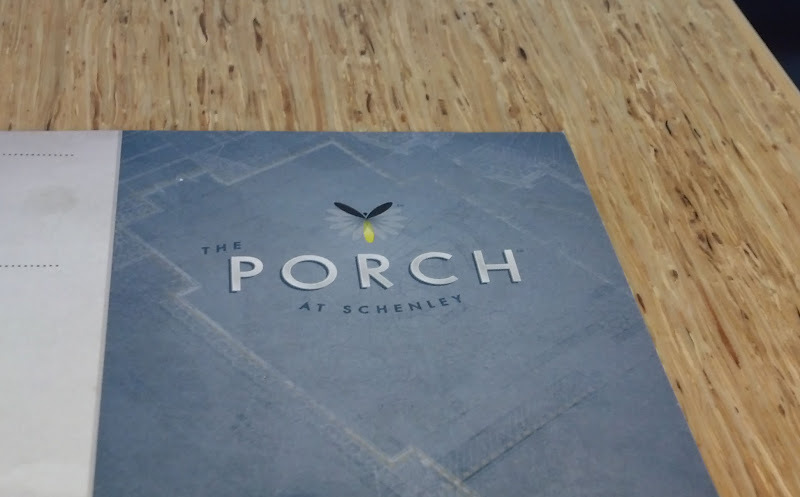 The Porch is in Oakland, in Schenley Plaza, across from Hillman Library at Pitt. Thanks to the Pitt students being on spring break, we were able to find on street parking right in front. It was a bit before 6 pm (it only took us about 20 minutes to get there - no parkway traffic!). We were seated right away at a table along a curved bank. It wasn't too crowded yet, which was nice, and by the time we left around 7:30, it was filled. 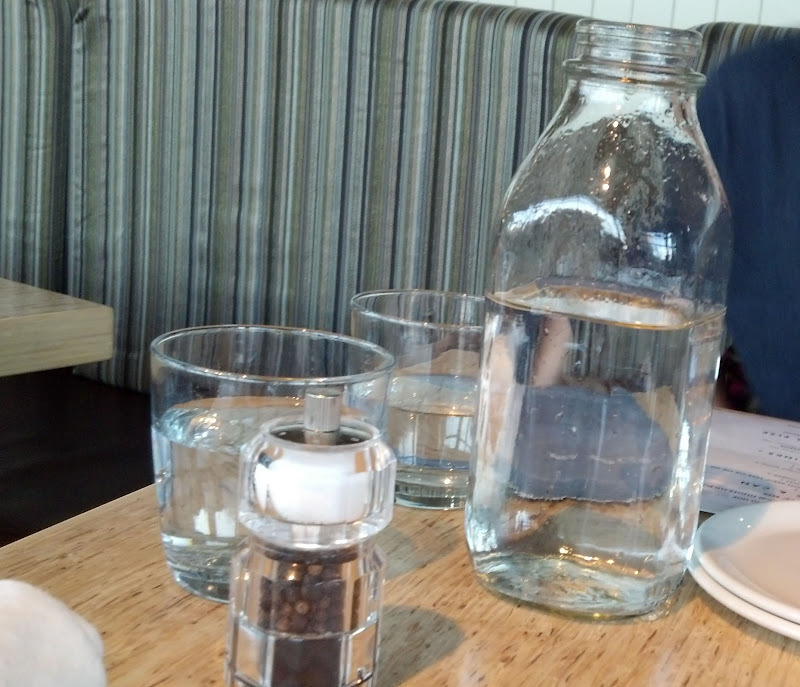 Our server brought us a bottle of water and described the specials to us. I'm not really sure how to describe The Porch. The outside is glass, wood, stone and very... angular? Modern? Inside, the ducts, etc., are exposed in the ceiling, colors are neutral, lots of windows for lots of natural light, it can get a bit noisy. I wouldn't call it cozy, but it's not cold and impersonal, either. It was definitely bright inside - good for taking photos, especially since I forgot my 'real' camera so I had to use my cell phone! 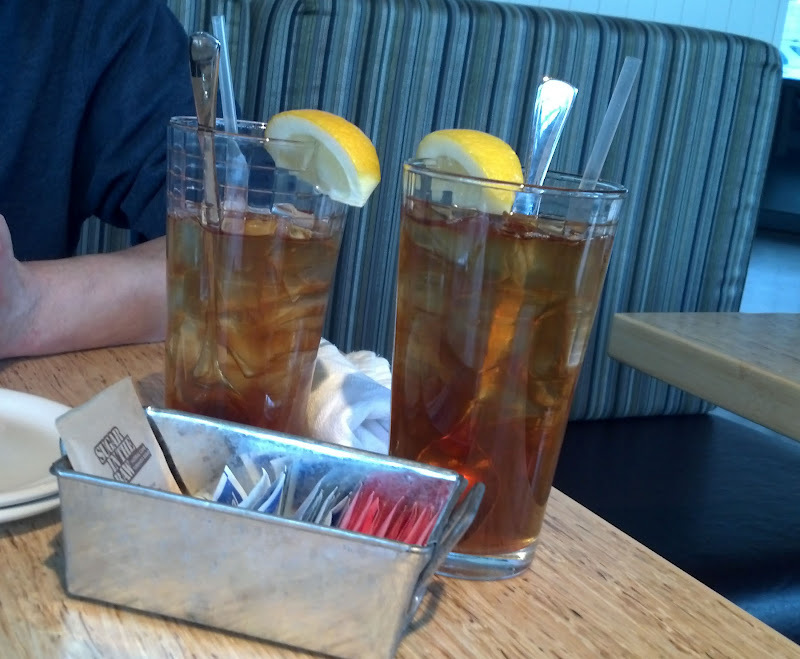 As usual, iced teas for us. Fresh brewed. Good iced tea. 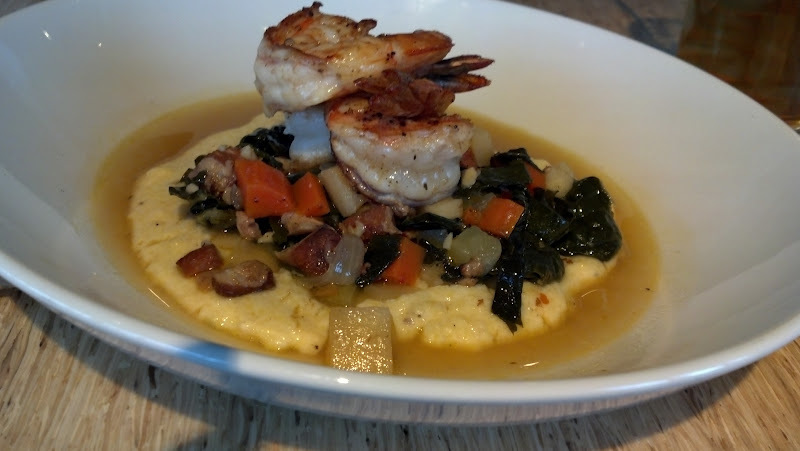 We decided to share the Shrimp & Grits from the 'This & That' portion of the menu. I take 'This & That' to mean appetizers, and this was a good sized appetizer for us to share. Three shrimp nestled atop a bed of parmesan polenta, braised kale, some carrots and other veggies, a sauce, and some bits of a smoky pork. Delicious! SP declared it the best kale ever and it must be because even I enjoyed it and usually I don't much care for kale. For his meal, SP chose a special of the day: Mahi Mahi. 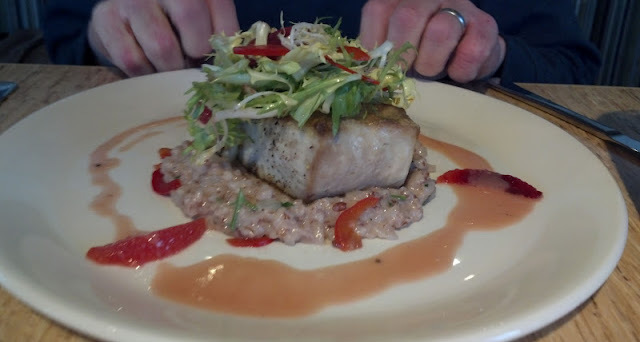 The fish was on top of risotto, which looked like it was cooked in or mixed with some of the blood orange sauce drizzled on the plate. There were some greens on top the fish and some segments of blood orange, too. He said it was a very good dish and he enjoyed the blood orange sauce so much that he wished there had been more on the plate. 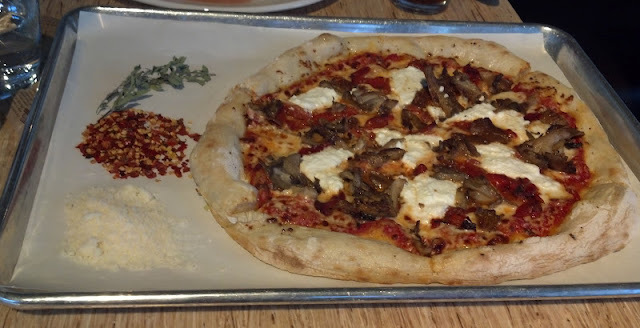 I decided to try the pizza special: Ricotta, Roasted Red Pepper, and Mushroom. I like the presentation. The pizza on a cookie sheet with 3 garnishes on the side: parmesan, crushed red pepper flakes, and dried oregano. Our server told us the chef grows his oregano and then dries it. I really enjoyed crumbling the dried oregano over the pizza and it added a wonderful flavor. Lots of mushrooms and peppers and cheese. The crust was a thinner crust - not super thin but definitely not a thick crust. I folded each slice in half to get it to my mouth! The crust was also a chewier rather than crisp crust. A very tasty pizza. I ate half and took the rest home for lunch the next day. We were full and we had been talking about walking over to Dave & Andy's for ice cream, but of course we had to consider the desserts at The Porch. There wasn't a printed dessert menu, our server told us the options. There was a trio of homemade gelato (chocolate, vanilla, hazelnut), a trio of sorbet (lemon, blood orange, passionfruit), a plate of cookies and/or biscotti, a few other options and then the last one: donuts. So much for Dave & Andy's ice cream. 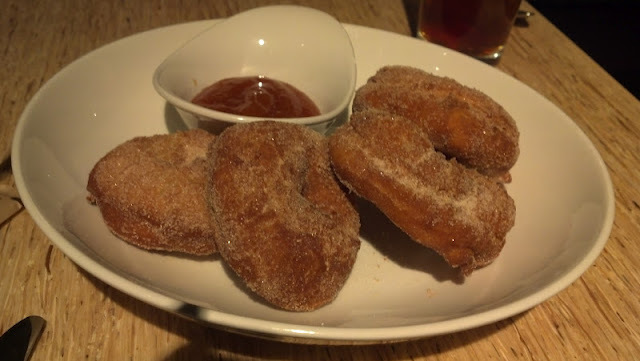 I can never resist dessert donuts! There were four good sized donuts covered with sugar, warm, and served with a peach dipping sauce. For only $4! I thought that was a very reasonable price for this dessert. The peach sauce was delicious and we liked dipping the donuts in a fruit sauce instead of the usual chocolate or caramel sauce. 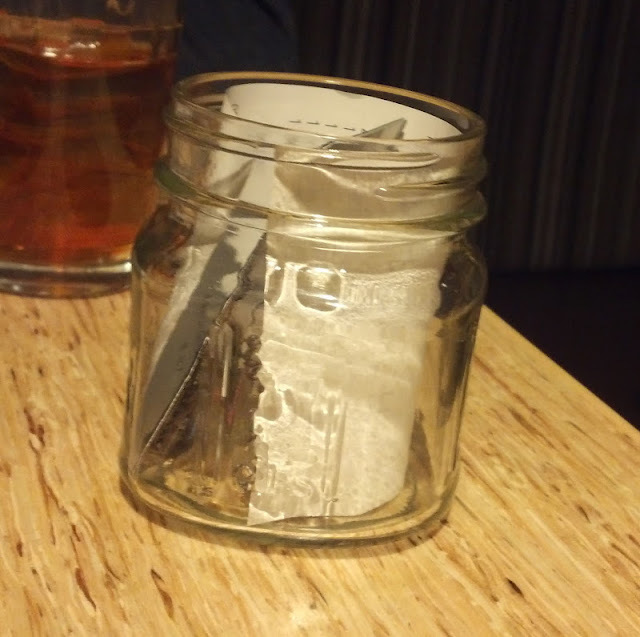 Our bill came inside a small glass jar! Overall, we really enjoyed our meal at The Porch. I didn't spend too much time looking at the wine/beer/mixed drinks menu, but I remember seeing a drink called 'Almost Arnie' which sounded tasty (limoncello, iced tea, mint). I'd like to go back in a warmer month and sit outside and sip an 'Almost Arnie!' The Greystone wines are made for The Porch by the Culinary Institute of America and our server mentioned that a lot of patrons really like the Greystone Cabernet Sauvignon (there's also a Greystone Chardonnay). I saw a large group sharing pitchers of sangria that looked tasty, too - another good option for sipping while outside in the coming warmer months. I was a bit apprehensive before our trip because I read some reviews mentioning horrible service, but we experienced very good service. 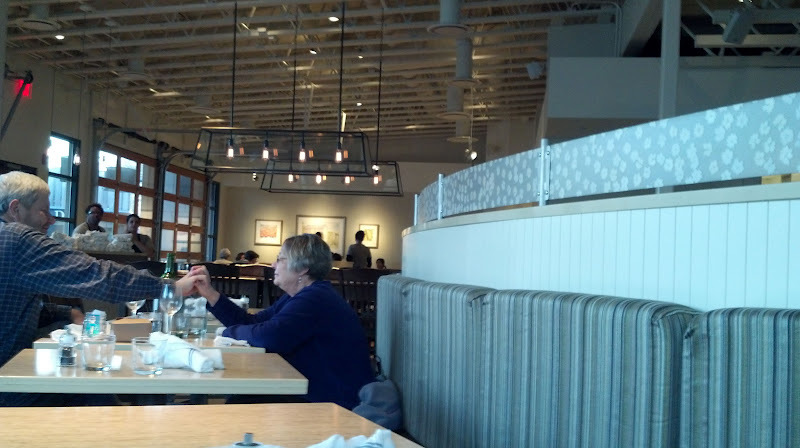 The hostess was friendly, moved the chair from the table so the wheelchair had space. Our server was pleasant and chatted with us a bit. She asked if we wanted our 'This & That' before our entrees - I suppose the 'This & That' options are substantial enough that a larger group could order a few, share them while sipping on cocktails, maybe order a pizza to share, and be full without ordering one of the entrees and having a traditional appetizer-soup/salad-entree-dessert kind of meal. I also saw some complaints about The Porch being over-priced for Oakland/a campus area. I can see some university students feeling that way. 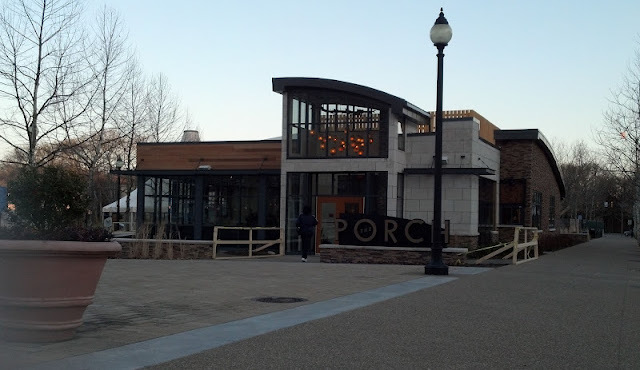 I certainly, when I was an undergrad/graduate student, wouldn't frequently dine at a place like The Porch. But there are lots of other nearby options for cheap college eats, and this is a great place for more upscale dining for parents of students, university employees, nearby hospital employees, museum employees, and visitors.